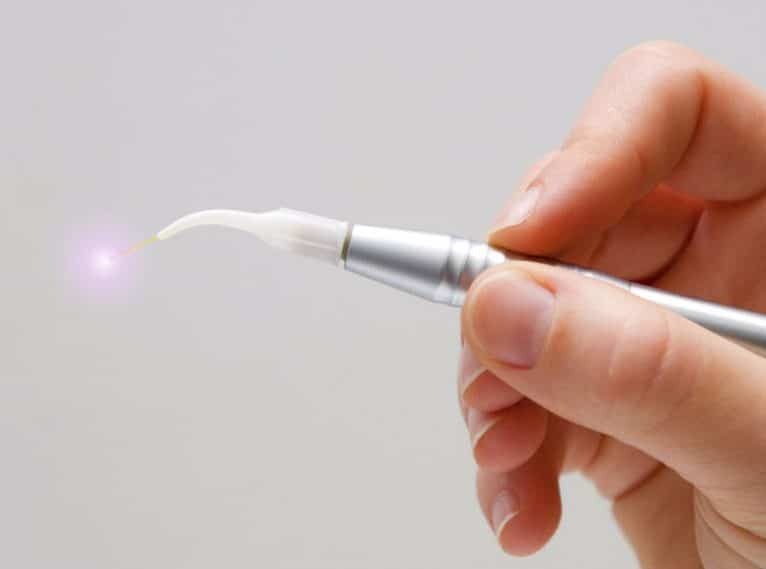 In dentistry, lasers can be used for a variety of procedures, including dental surgery, filling cavities, teeth whitening, detecting cavities, and soft tissue healing. Dr. Michael is a certified laser dentist currently using three types of dental lasers – Waterlase iPlus by Biolase (high power laser), Diagnodent (diagnostic laser), and a Therapeutic Laser (low power laser) . High power lasers such as the Waterlase iPlus are commonly less painful than drilling, minimize bleeding, and may preserve more of your healthy tooth during cavity removal. At Sarasota Dentistry, Dr. Hank Michael uses these state-of-the-art dental lasers to deliver precise, effective, and efficient dental care for patients. There are many lasers that are designed for dentistry. The first dental lasers were approved for use in soft tissue applications in the early 1990s. Hard tissue (tooth material) lasers took longer to perfect. The WaterlaseMD Hard & Soft Tissue Laser was the first laser cleared by the FDA to operate on the tooth structure, approved in 1998. Since then, this laser has also been cleared by the FDA for numerous additional procedures on bone, teeth and gum tissue. Dr. Michael added the WaterlaseMD to his practice in 2007 and became certified to perform numerous hard and soft tissue laser procedures. In 2013, he upgraded the WaterlaseMD to the newest and most advanced dental laser to date – the waterlase iPlus. In addition to the iPlus laser, Dr. Michael also utilizes a diagnostic laser to detect cavities called the Diagnodent and a therapeutic laser used to stimulate healing of the soft tissue. The iPlus laser works by spraying a mist of water into a beam of laser light. The laser energy has been specially designed to split water molecules resulting in microscopic explosions of water molecules. The energy from these microscopic explosions gives the dentist the ability to cut soft & hard tissue – a process called ablation. Many patients report that dental lasers are less painful than scalpels, reducing their need for sedation dentistry. The damage to tissue next to the laser incision is less severe than if a scalpel was used. This leads to quicker healing and less pain. Dental lasers also tend to cause minimal bleeding and less swelling during soft tissue treatments. These are just some of the benefits of using approved dental lasers in hard and soft tissue procedures. At Sarasota Dentistry, we are focused on offering the highest level of care. We believe the best way to do this is a commitment to ongoing dental education. Dr. Hank is specially trained in the use of the WaterlaseMD and iPlus dental lasers for hard and soft tissue dental treatment. To learn more about laser dentistry and find out the dental care options available to you, make an appointment with Sarasota Dentistry today. What dental treatments are performed with the WaterlaseMD and Waterlase iPlus? Laser dentistry is a safe and effective dental treatment method. The dental laser used by Dr. Hank at Sarasota Dentistry has been approved by the FDA for use in dental procedures. In fact, some of our patients prefer laser dentistry to traditional treatment because it is less painful than procedures that use scalpels or other instruments. Are all dental lasers the same? No, it depends on the application the laser is being used for. Each laser has a procedure it is specially designed for. Sarasota Dentistry uses the WaterlaseMD and Waterlase iPlus lasers -- the first FDA-approved dental laser -- in a variety of our dental procedures. The short answer is simple - it costs about the same as traditional dental care. Now if you calculate the prevention of large fillings by using the Diagnodent to detect small cavities... then you are saving money. Prevention, faster healing and less pain are the most common benefits of laser dentistry. Will my dental insurance cover laser dentistry? A dental laser is an approved instrument that is designed to complete a more specific procedure. Your dental insurance benefits will pay the cost of your treatment based upon the completion of the procedure and the details of your benefit plan. The type of instrumentation used -- in this case, a dental laser -- does not affect whether or not your dental insurance will cover the cost of the procedure.